The faculty of Physical Therapy held a seminar on “The Civil and Criminal Liabilities of the Physical Therapist” in collaboration with the faculty of Legal Studies and International Relations on Tuesday 27/2/2017. 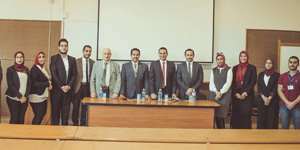 The seminar was held in the presence of Mr. Al Sayed Abdel Razek Azazy, the President of the Court of Criminal Appeal; Mr. Mohamed Hani Mubarak, the Deputy Attorney General and the Amreya District Attorney; Prof. Awany Rahmy, the Dean of the faculty of Physical Therapy and Prof. Alaa Ismail, the Head of the Criminal Law Department at the faculty of Legal Studies and International Relations. The coordination of the seminar was managed by Dr. Rania Hassan, the student activities leader at the faculty of Physical Therapy.